At Budget Blinds of West Seattle, we're your local neighborhood experts that truly understand your needs. We're in your neighborhood, we know the local West Seattle weather and community, and we’re backed by the #1 provider of blinds, shades, and drapes in North America. Over 25 years of customer satisfaction gives you peace of mind that only comes with choosing the proven leader. We bring the showroom to you in West Seattle. We expertly measure your space, install beautiful window treatments, and back it up with the best warranty in the business so you can sit back and relax in the beautiful, West Seattle weather and sunshine. We serve to give you the best in window treatments, so you can rest easy knowing your space will be beautified and optimized with window treatments that fit your individual needs. If you’ve been thinking about transforming your home’s interior into something truly special, Budget Blinds of West Seattle is here to help. Our expert design team, paired with an array of stunning blinds, shades, shutters, drapery, and more creates the ideal home interior that complements any room, or an entire home. From the latest styles and innovative fabrics, to a host of on-trend colors, we’ll show you how fun and affordable it can be to upgrade your décor with the power of the #1 provider of custom window coverings in North America. Our consultative process is designed around caring about you and your home. We make the entire experience easy and convenient as we bring the showroom to you with our FREE in-home design consultation. From those unique shaped windows to energy efficient treatments, and more, Budget Blinds does it all for you, with style and service for any budget! We're local and here to stay to ensure you have peace of mind. I very strongly recommend Budget Blinds of West Seattle. I recently moved to West Seattle, purchased a 96 year old house - with paper "staging blinds" that had been hanging in the windows in this adorable house for 6 years. I contacted Budget Blinds of West Seattle as I read many good reviews on Yelp and I wanted to buy locally. Co-owner Kendra listened to my concerns, both the clean look I wanted and the financial restrictions. I did not think I could afford more substantial options. 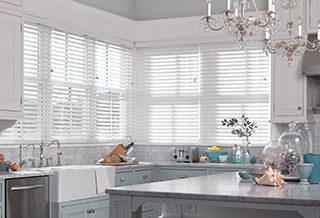 Kendra loves older homes and knew that plantation shutters would look amazing. She measured and quoted both the cell blinds I was sure I wanted, and also quoted the shutters that definitely suited the integrity of the house. I am so happy that I kept an open mind and listened to Kendra - a true professional. The installation of my shutters was done by her husband, the co-owner of the business and a great installer who has been with them for years. Awesome job - very fast and very clean! The office personnel were very friendly and kept me informed through-out the whole process. It is wonderful to find such great customer service and quality care. Thanks. Lori H.
I called Kendra because she had helped me re-treatment my whole house a few years ago, and I knew from experience she would spend a lot of time with me, helping me find exactly what I wanted, especially because I just really didn't know what I wanted in the new kitchen space. She is super friendly, personable, helpful, and just always concerned that you find just want you want, not what she thinks you should have. She brings tons of samples, shows up on time, and is very reliable. The company installs the blinds as part of the cost, and they are really concerned with making sure your space is kept in good condition and everything works just right. I had a difficult space this time, with two windows in each section, one had a narrower sash than the other, but the woven wood blinds fit just right, look great and people always notice them. There were no problems at all. They were all very professional and the installer was polite, efficient and did an excellent job of cleaning up after the work was completed.They were friendly, professional and did exactly what they said they would.